Today, dramatic increases in the cost of oil and significant innovations in high-performance metal coating systems have considerably narrowed the cost differential between asphalt shingles and metal roofing systems. 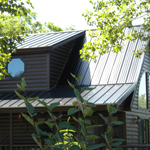 Plus, when you factor in the long lifecycle of metal compared to asphalt shingles, homeowners are beginning to understand the true value that metal roofing brings to a home. This is a major reason why metal is the fastest growing category of roofing in the U.S. LEARN MORE about the advantages of metal roofs over asphalt shingles. Professional siding, home renewal, and roofing!